Yesterday my mom and I went holiday gift shopping. It turned into me buying myself my holiday gifts for SP to give to me, but somehow I don't think he'll mind that he doesn't have to go to the mall. We got hungry around 11:30 am and since we were at the Galleria in Mt. 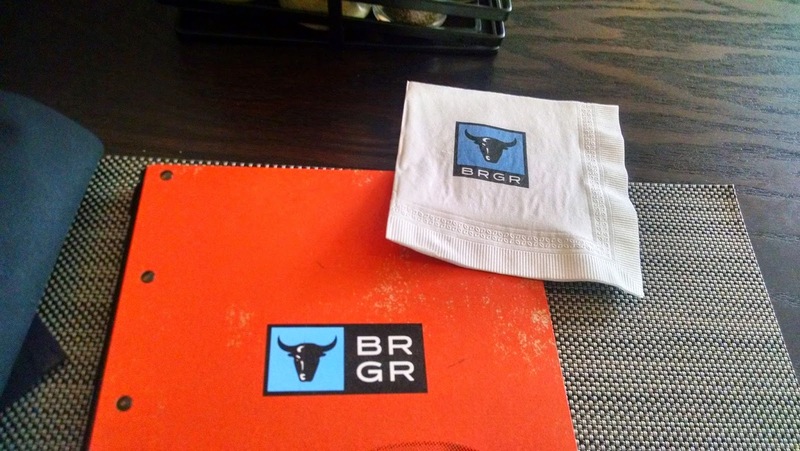 Lebanon, we decided to try the recently opened BRGR. 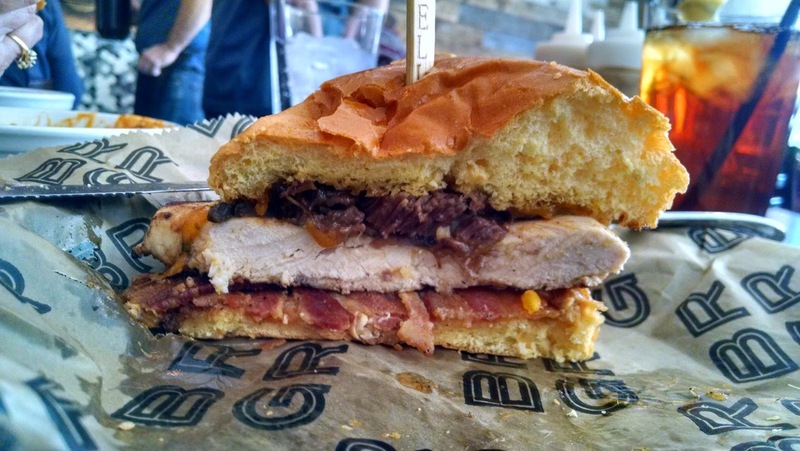 There are several other locations (and a food truck) but I had not tried any of the BRGR locations. This one is on the third level. I think there used to be a Mexican restaurant in the space. Inside it's bright and spacious. Wood tables with placemats, wood beam walls, there is a patio that will be open in warmer weather, TVs placed around the space. Mom and I liked it - welcoming, not too loud, bright, and a nice amount of space between tables. This was tasty. It definitely, for me, had a kick, and I would not be able to eat this myself. 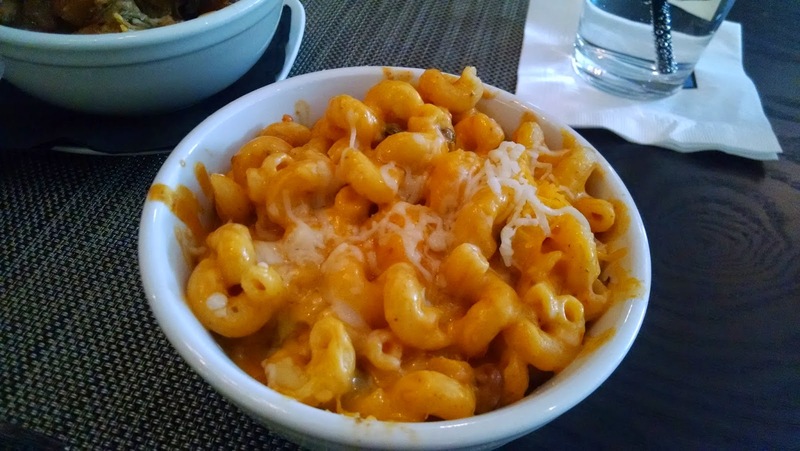 It tasted like a cheese and salsa mixture mixed with pasta and there were some beans as well. 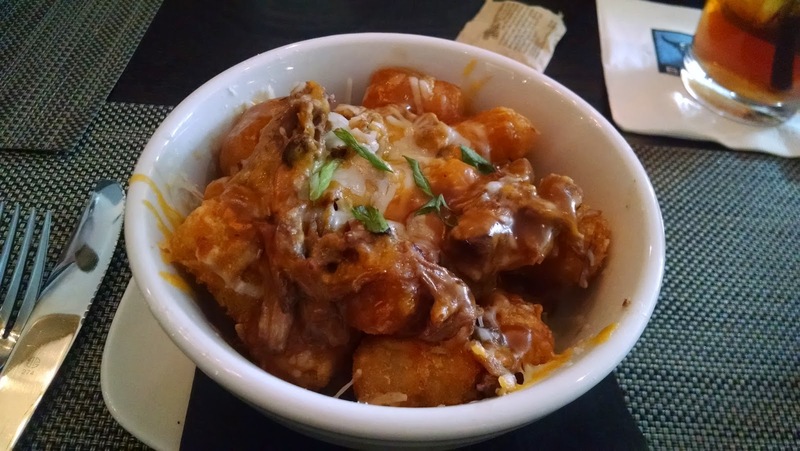 Mom also ordered Pot Roast-n-Tots - slow braised pot roast over crispy tater tots, bacon lardons, beef gravy, smoked gouda cheese. Are tater tots becoming a "thing" or I have just been finding them lately? These were tasty! Mom really liked them, too - she ate all of these (but only half her mac n cheese). Definitely a good appetizer choice. Many of the burgers sounded yummy. Many of the special burgers sounded yummy - like the bacon wrapped meatloaf with potato salad and onion straws. But I wasn't in a burger mood. 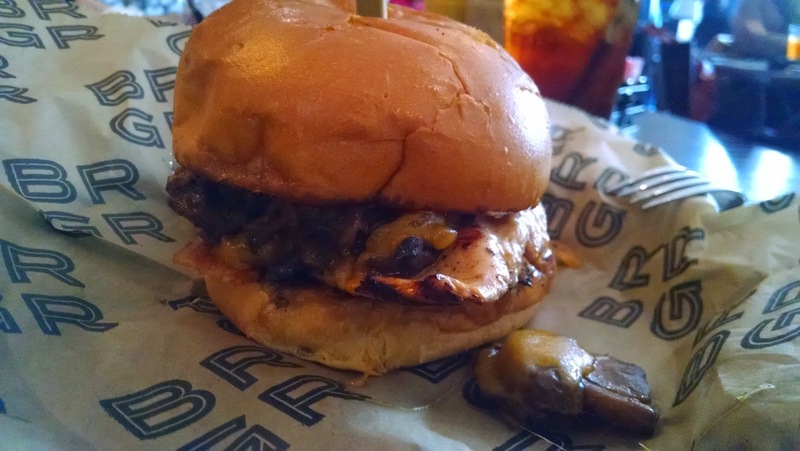 I crafted my own burger, which was not a burger but instead was grilled chicken on brioche with smoked cheddar, bacon, mushrooms, and braised short ribs. I kind of wanted caramelized onions or onion straws and tomato and some greens as well but... well, no need to go crazy. This was good. I love brioche, love squishy buns. Nicely cooked chicken (cooked through but not dried out). A nice helping of bacon and of short ribs. Delicious. I wanted to finish the entire sandwich, but I was getting kind of full and I don't like over-eating at lunch, so I brought half the sandwich home. The hostesses were friendly, found a great table for the wheelchair and removed a chair without asking or needing to be asked. Our server was also friendly and explained he was training someone that day. He accidentally filled mom's Sprite with water and walked away, but he realized his mistake and returned a few moments later with apologies and a fresh soda. The manager was going around, checking on tables. Will I be back? Definitely. Great service, tasty food, a parking lot (not street parking) plus several other items I want to try - Grilled Cheese Bites, Fried Pickles, Button Buster Burger plus the spiked shakes. I also really like the ability to create my own sandwich. And the desserts in mason jars sounded good, we were just too full. I can see some special burgers SP will be interested in (salmon patty, mahi mahi & shrimp patty) plus some toppings that will excite him (spicy mango slaw). I didn't realize it until after we left, but the burgers do not come with fries or chips, which seems odd, but since I'm not normally a fries/chips person, I don't mind the way someone else might mind.